I've been amiss lately in stitching on a round-robin I'm in. It is a relaxed robin, no deadlines...but even so, I have let everything else come first. So, I made it my number one stitching priority after retirement...to use my extra time. The group is several lovely ladies that have befriended me (and I them) on my chat message board at HGTV. 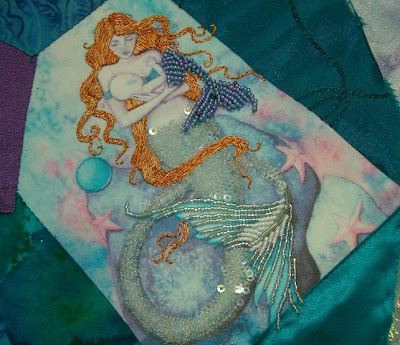 The robin is a crazy quilt block, about 20 inches in size, with a mermaid theme. 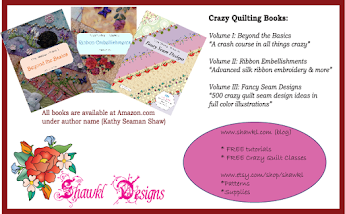 However, in reality, it is more of an art block than a true crazy quilt block. We are moving outside out 'norm' and are truly loving the experience. So, here's my work so far on Nicki's block...she did the beading on the baby mermaid. I thought that sequins (several hundred) were a good accompaniment to the baby. And the hair is done in 3 color silk thread; split stitch and long/short stitch. I'm working on the second mermaid now...a blond! And I'll post her photo here when done. This last group of stitches was completed while on vacation with my friend Talia last week. Of all the ones I got done…this is my very favorite. I like the simplicity of the stems and the width of the stitch. It will really come in handy to fill in some space…and when I get to a tighter area along the seam, I’ll just shorten the stem until there is nothing left! The stitch is worked in a beautiful variegated soft blue that reminds me of calm clear ocean water. This stitch was a little tricky to wrap all the intersecting posts and add the French knots. Seed beads might have looked better…but I like the stitch. It is really nice with the variegated gold/yellow thread. 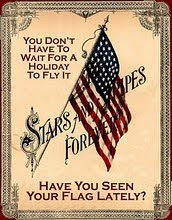 Wish you could see it for real! This stitch uses the same process as the last stitch. I think this one would be really great with 4mm crystal bicone beads instead of the French knots. Okay, back to wrapping the loops again. I have decided that I make more uniform stitches with the back stitch than with a running stitch. I back stitch from left to right, then on the return I wrap. 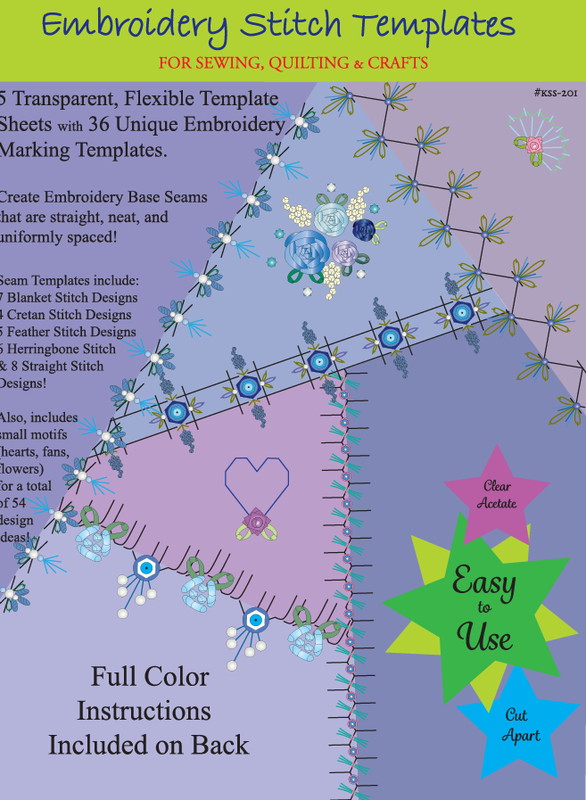 Then I add the daisy stitches and French knots…and any little straight stitches that might be needed. The loops are not wrapped for this one, just a simple back stitch (try to make them uniform in size). The “spokes” are straight stitches. All is done is bright green perle cotton, size 8. The loops are done in backstitch then wrapped for this stitch, but the straight stitches are just a single thread. The thread is size 8 perle in a purple for the entire stitch. Here’s a stitch with all the spokes and loops done in backstitch then wrapped. By working from the outside edge of each spoke the last stitch can end at the center. The thread is size 8 perle in a variegated blue for the spokes and a solid blue for the loops and French knots. 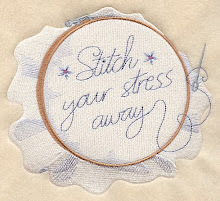 This is an adaptation of the last stitch…replacing the French knots with detached chain stitch. Well, I’m back to using size 8 again…in dark rose and pink this time. I really like stitching the backstitch and then wrapping it. Experimenting with changing the shape of the loop by making it longer or shorter is also fun. The “T” shape on this stitch is also wrapped; but, could be done is just a basic straight stitch. This stitch is worked in size 12 perle cotton, which makes a thinner stitch line that the perle eight and perle five I’ve been using. When finished, I noticed that the stitch reminds me of boat anchors. So, it would be a good stitch to use for nautical blocks for sure! I couldn’t quite get the curve uniform on this stitch. But, it is still very pretty, even with its faults. A soft lilac was used for the curve, stitched in backstitch then wrapped. The detached chains are in a light moss green. The French knots are done in a variegated pink. The entire stitch reminds me a little of an inverted group of candle operas. What an imagination I have!